Your demo request has been received. We will reach out to you shortly to schedule a time to chat. Thanks! COMMERCIAL DEVELOPMENT IS DIFFICULT. YOUR FINANCIAL REPORTING SHOULD NOT BE. SPEND LESS TIME CHECKING NUMBERS AND MORE TIME GETTING YOUR PROJECT BUILT. "there is more financial TRANSPARENCY when purchasing a two-dollar cup of coffee than when managing a twenty million dollar development. 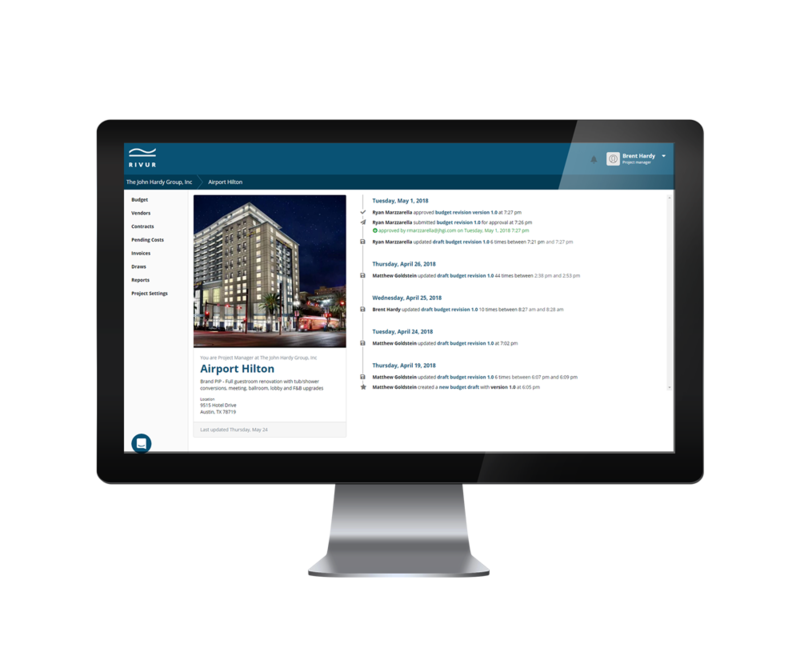 giving cre professionals real-time controls and insights into their at-risk capital is what rivur is all about." - Brent Hardy co-founder Rivur, inc.
Get real time insights and controls into your at-risk capital. Rivur is built from the ground up for commercial real estate development. We make sure your team is gathering and recording all the important documents you need to keep projects out of trouble. Rivur enforces and automates business rules providing confidence that approvals and other requirements are properly managed and recorded. Guarantee that your project is always compliant with partnership or lender obligations. Draw packages are are pain point for every commercial developer. Rivur makes this monthly reporting requirement easy and automated. Create sophisticated draw packages that can be routed to lenders or capital partners with a simple click of a button. Invite vendors to collaborate on projects and reduce your workload. Vendors can submit invoices, lien waivers, Insurance Certificates, and other required documents. Rivur will automatically flag any missing or out of date information and request updates from the Vendor on your behalf. Rivur continuously monitors your project to identify and assist in resolving any questionable or critical issues. Your team is alerted to potential concerns for review and resolution. Let Rivur’s intelligent platform focus your team’s efforts to minimize workload. Rivur delivers portfolio as well as project-level reporting. Easily manage, analyze detailed information across your portfolio of active and resolved assets.